Armory Shell Packs: Mapex started the design of Armory with the idea that players want to spend more time playing and less time tuning their drums. The result is the SONIClear™ Bearing Edge, which increases the contact between the drumhead and shell and allows the head to sit flat on the edge, this produces a stronger and more centered pitch and makes the drums remarkably easy to tune. Choose Your Weapon: And there's more? Yes! Mapex is introducing the Armory Snare Drum Series, which includes FIVE drums, each with their own unique sonic personality and look. Although all the drums will be available individually, Mapex is giving players the freedom of choosing which of the five Armory snare drums they want matched with their Armory kit via a "Trade in Program". Every Armory shell pack includes an Armory "Tomahawk" 14" x 5.5" black plated steel snare drum, but players can swap that snare drum for any of the other 4 snare drums in the Armory line. Mapex isn't just throwing in a cheap snare with the shell-pack - they want to provide a serious snare drum that players will love and gig with, not store in the attic. 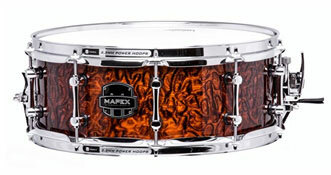 Peacemaker - The pop and crack of this 14" x 5.5" Maple/Walnut Hybrid shell penetrates with each shot. THE PEACEMAKER will settle any disputes as to who keeps the best time in the band. Armory Hardware: More? Really? The Mapex Armory Series Hardware line offers players a choice of three different finishes to complete their look: Black Plated, Black and Chrome Plated, and traditional Chrome Plated. Each piece in the line is packed with features and value, including a new double-braced leg shape that folds tighter for compact storage. Armory stands are heavy duty, extremely functional and available in packs or as individual pieces.